Orange Business Services announced a global expansion of its Business Together as a Service, which provides unified communications to large enterprises. 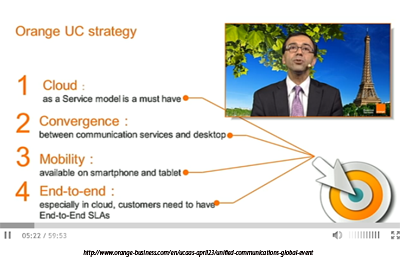 This Unified Communications as a Service (UCaaS) is hosted in three regional data centers (Atlanta, Frankfurt and Singapore) that Orange Business Services has dedicated to cloud computing infrastructure. The service provides end users with a unified telephony, email messaging, IM/presence, audio and Web conferencing, contact center service, video and mobility. Orange is provided a pay-as-you-go cloud model. The service is powered by equipment from Cisco. 3M is using Business Together as a Service to improve collaboration and productivity among its 20,000 employees in 25 countries in Europe, Middle East and Africa. Orange Business Together as a Service is now available worldwide, including versions in 29 languages. Citing a 21% surge in wireless data revenues, AT&T reported consolidated Q1 2013 revenues of $31.4 billion, down 1.5 percent versus the year-earlier quarter and up 0.9 percent when excluding revenues from the divested Advertising Solutions business unit. Net income totaled $3.7 billion, or $0.67 per diluted share, up from $3.6 billion, or $0.60 per diluted share, in the year-earlier quarter. Project VIP is ahead of schedule. Nearly 90 percent of the LTE buildout covering AT&T's 300 million POPs will be completed by year end. CAPEX for 2013 is now expected in the $21 billion range. CAPEX for 2014 and 2015 are expected to be in the $20 billion range for each year, with no reduction in the Project Velocity IP (VIP) broadband expansion. Previously, the company expected capital spending of $22 billion annually in 2014 and 2015. AT&T is achieving savings through greater integration efficiencies in Project VIP, accelerating LTE build in 2013 and other ongoing initiatives. Total wireless revenues, which include equipment sales, were up 3.4 percent year over year to $16.7 billion. Wireless service revenues increased 3.4 percent in the first quarter, to $15.1 billion. Wireless data revenues increased 21.0 percent from the year-earlier quarter to $5.1 billion. First-quarter wireless operating expenses totaled $12.0 billion, up 3.2 percent versus the year-earlier quarter, and wireless operating income was $4.7 billion, up 4.1 percent year over year. AT&T added 291,000 wireless subscribers in the first quarter. Subscriber additions for the quarter included postpaid net adds of 296,000. Postpaid net adds reflect 365,000 postpaid tablets added in the quarter. Connected device net adds were 431,000. Prepaid had a net loss of 184,000 subscribers primarily due to declines in session-based tablets and declines in GoPhone. Reseller had a net loss of 252,000. 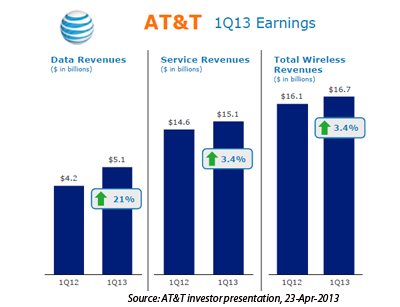 AT&T added 1.2 million postpaid smartphone subscribers in Q1. 72 percent, or 48.3 million, of AT&T's postpaid phone subscribers have smartphones, up from 61 percent, or 41.2 million, a year earlier. Smartphones represented 81 percent of postpaid device sales and 88 percent of postpaid phone sales in the quarter. AT&T’s ARPU for smartphones is about twice that of non-smartphone subscribers, and about 90 percent of postpaid subscribers are on FamilyTalk, Mobile Share or business plans. About 60 percent of AT&T’s postpaid smartphone customers now use a 4G-capable device, with more than half of those using LTE devices. Total first-quarter wireline revenues were $14.7 billion, down 1.8 percent versus the year-earlier quarter and down 1.8 percent sequentially. Total U-verse revenues grew 31.5 percent year over year and were up 5.0 percent versus the fourth quarter of 2012. Total U-verse subscribers (TV and high speed Internet) reached 8.7 million in the first quarter. U-verse TV added 232,000 subscribers, its best net gain in nine quarters, to reach 4.8 million in service. U-verse High Speed Internet delivered a best-ever net gain of 731,000 subscribers to reach a total of 8.4 million. Overall, the company added 124,000 wireline broadband subscribers, the best quarterly increase in eight quarters. More than 56 percent of U-verse broadband subscribers have a plan delivering speeds up to 10 Mbps or higher — up from 50 percent in the year-ago quarter. Total business revenues were $8.9 billion, down 3.4 percent versus the year-earlier quarter, and business service revenues declined 3.5 percent year over year. Both reflected a slow economy and weak government and business spending. AT&T's most advanced business solutions — including VPN, Ethernet, hosting and other advanced IP services — grew 10.8 percent versus the year-earlier quarter. These services represent a $7.9 billion annualized revenue stream. 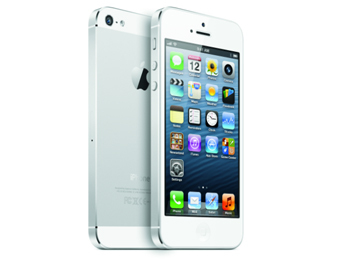 Apple reported sales of 37.4 million iPhones in Q1, compared to 35.1 million in the year-ago quarter. iPad sales reached 19.5 million, compared to 11.8 million in the year-ago quarter. Meanwhile, sales of Macs were just under 4 million Macs, compared to 4 million in the year-ago quarter. “We are pleased to report record March quarter revenue thanks to continued strong performance of iPhone and iPad,” said Tim Cook, Apple’s CEO. Vitesse Semiconductor expanded its Serval Carrier Ethernet Switch Engine portfolio with new silicon optimized for IP Edge and Ethernet/MPLS access applications, including mobile backhaul, cloud access and business service delivery. The company outlined a new Vitesse Service Aware Architecture (ViSAA) that provides a hardware-based service layer for wirespeed processing needed for QoS, management, and performance monitoring of Carrier Ethernet services. 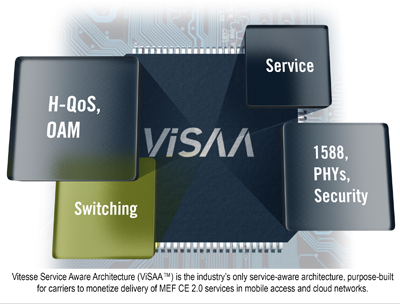 The new Serval-2 (VSC7438), which leverages the new Vitesse Service Aware Architecture (ViSAA), is designed to simplify carrier delivery of MEF CE 2.0 services in packet-based mobile and cloud access Ethernet networks. Whereas current solutions typically involve external FPGAs or NPUs to enable Carrier Ethernet features, the Serval-2 silicon executes performance-critical functions including OAM and protection switching, and maintains wirespeed performance for even the most demanding service delivery functions. It also integrates VeriTime nanosecond-accurate IEEE1588v2 timing technology that meets LTE and LTE-Advanced network requirements, including those of variable-rate and asymmetric millimeter wave and microwave links. Scalable support of multiple 1 Gigabit Ethernet (GE) and 10 GE ports without the need for additional external components. Hierarchical QoS (H-QoS) support for high bandwidth, media rich traffic delivery over 4G networks. Serval-2 is expected to begin sampling in Q3 2013. "Serval-2 revolutionizes the way in which Carriers can deliver services over Ethernet for high bandwidth mobile backhaul, video distribution, cloud access and more," said Uday Mudoi, product marketing director at Vitesse. "Vitesse Service Aware Architecture enables efficient delivery of these services. Serval-2 represents Vitesse's continued focus on delivering solutions for a new generation of network access equipment for mobile/IP Edge and cloud." 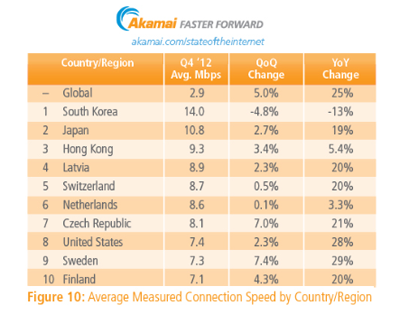 The global average connection speed rose 5 percent to 2.9 Mbps, according to Akamai's newly released Fourth Quarter, 2012 State of the Internet Report. Akamai counted nearly 700 million unique IPv4 addresses from 240 countries/regions connecting to its Intelligent Platform in 4Q 2012, representing a 13% growth over 2011. The company estimates that over 1 billion unique Web users connected to its platform during the quarter. Year-over-year, the global unique IP address count increased by nearly 10 percent, or more than 71 million, compared to the fourth quarter of 2011. Akamai customers reported 768 DDoS attacks in 2012, up more than 200 percent from 2011. NTT Communications (NTT Com) opened its Tokyo No.6 Data Center, a disaster-resistant facility with a total floor area of 22,000 square meters, enough to accommodate approximate 3,000 racks. Tokyo No.6 Data Center is the first of several major NTT Com data centers that will combine globally standardized service agreements, service level agreements (SLA) and customer portals with special cost-reducing features, such as advanced air conditioning systems and virtual-network-based global seamless services, including hybrid clouds. 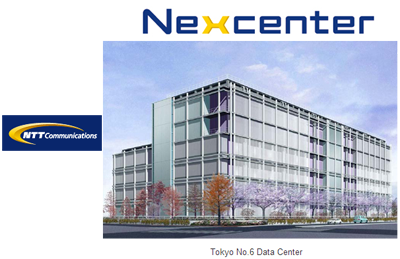 NTT Com is now marketing its data centers worldwide under a new "Nexcenter" brand. NTT Com operates data centers in more than 140 locations, amounting to a total server room floor area of over 170,000 square meters. Located just seven minutes on foot from the JR loop train line, making it highly accessible even during emergencies. A large rotary UPS. Racks handle equipment up to 1.5 times larger than the conventional racks, helping to lower user costs by as much as the half compared to previous rates. Aseismic isolation structure can reduce the impact of earthquakes by at most 80%. Resistance is rated to withstand forces as powerful as those generated by the unprecedented Great East Japan Earthquake of 2011. An extra-strong ground helps to prevent liquefaction, and the building foundation is 1.4m higher than ground level to avoid flooding. Redundant major power supply and air conditioning systems strengthen reliability, and the facility has a direct connection to a large aseismic cable tunnel that protects lead-in cables from damage by earthquakes or drilling. Power usage effectiveness (PUE) is designed to rated at 1.2, the highest level among data centers in Japan. The facility features energy-efficient water-cooled air conditioning, low-power-loss rotary UPS, reduced-power air conditioning system through use of cooler outdoor air and efficient air-flow management to prevent the circulation of server-generated heat. 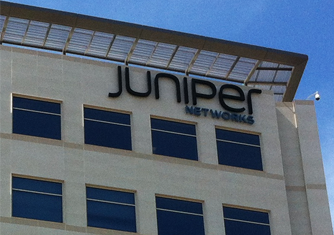 Juniper Networks reported preliminary revenue for Q1 2013 of $1,059 million, down 7% from Q4'12 and up 3% from Q1'12. The company posted GAAP net income of $91 million, or $0.18 per diluted share for the first quarter of 2013. GAAP diluted net income per share includes a $0.05 tax benefit related to a tax settlement, a $0.02 pre-tax impact from a litigation charge as well as a $0.01 pre-tax impact from restructuring. "This was a quarter of modest year-on-year growth driven by renewed demand from service providers and offset slightly by softness in enterprise sectors, including federal and financial services," said Kevin Johnson, chief executive officer of Juniper Networks. "We are seeing increased momentum with our new product offerings as we continue our strategy of innovating in the domain of high-performance networking. We believe Juniper has a strong position in the service provider market and has opportunity in the enterprise business as we continue to grow switching as well as revitalize our security business. We continue to focus on delivering great products, improving operational execution, and managing our costs carefully." GENBAND introduced a new session border controller optimized for branch offices and small to mid-sized businesses. The new QUANTiX QFlex is an on-premise, software-based SBC that is deployable on common off the shelf (COTS) hardware or can be virtualized together with other applications on a platform. It enable carrier-grade security, interoperability and session control with support for more than 60 built-in IP PBX vendor profiles. GENBAND said it uses a unique and modular approach to solve multi-vendor interoperability issues, helping to reduce the deployment time of SIP Trunking services from months to weeks. GENBAND’s QUANTiX QFlex resolves IP-PBX-related interoperability challenges by providing a demarcation point that protects both the service provider and enterprise sides of the connection by utilizing flexible adaptors to secure and normalize traffic. For enterprises, QFlex allows for seamless interworking of multi-vendor PBXs across different branch offices, routes traffic in IP-enabled call centers, and allows remote users and satellite offices to securely connect to corporate IP communication systems. "Issues relating to IP communications security, interoperability, system complexity and service assurance are commonplace for operators and enterprises alike. They demand intelligent SBCs and border gateways that ensure a seamless communications experience," said BG Kumar, President of GENBAND’s Multimedia Business Unit. "Our new QFlex Enterprise SBC creates a SMART EDGE for the enterprise, providing unique interoperability technology to manage multi-vendor PBX environments – while ensuring security and session management." 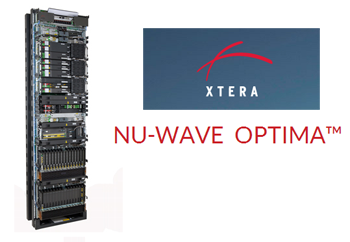 Eastern Caribbean Fiber System (ECFS) Consortium has selected Xtera Communications' Nu-Wave Optima equipment for the upgrade of its festoon subsea cable system. ECFS subsea cable system is made of 10 segments, connecting Tortola in the British Virgin Islands to Trinidad at the south of the Caribbean arc. The upgrade offers the possibility to mix 10G and 100G channel rates to support existing and emerging high-capacity services. Reconfigurable Optical Add Drop Multiplexers (ROADMs) are used in cable landing stations to avoid or minimize the number of regeneration points for island-to-island connectivity. Financial terms were not disclosed. VMware reported Q1 revenue of $1.19 billion, an increase of 13% from the first quarter of 2012. Net income for the first quarter was $174 million, or $0.40 per diluted share, down 9% compared to $191 million, or $0.44 per diluted share, for the first quarter of 2012. Company executives said Q2 revenue should be in the range of $1.21 billion to $1.24 billion. "We're very pleased with our performance this quarter, particularly in light of recent results from many of our industry peers," said Pat Gelsinger, chief executive officer, VMware. "VMware is the virtualization software infrastructure leader and the company most capable of providing an end-to-end infrastructure solution designed to bridge our customers' legacy client/server applications and desktops to next-generation applications for the mobile/cloud era. "